Along with breathtaking scenery from rolling hills to lakes, rivers and mountains, he says cyclists may even encounter some new friends en route. “We guarantee you the most enjoyable bike ride in the world. Why do you think that is? We have an amazing infrastructure so all the trails for bikers are super well marked and you know when you take a break you can even have a chat with the cows,” he says with a smile. New this year, the destination is offering vehicle-free “Ride the Alps” events for clients who want to ride the Swiss Alps without any cars. “Between May and September, we will close down 12 mountain passes across Switzerland so you can ride the alps car-free, there will be music festivals, and of course, good food and lots of happy people from all over the world,” he says. Closer to home, Switzerland Tourism is sponsoring free bike share rides in select cities across North America, including Montreal. 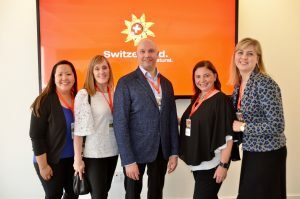 “Switzerland, we give you the ride of your life – amazing infrastructure, landscapes, and then our four official languages that give you a lot of variety, plus the convenience,” he says, noting the Swiss Travel Pass allows visitors to travel across the country by rail, road and waterways on an all-in-one ticket. 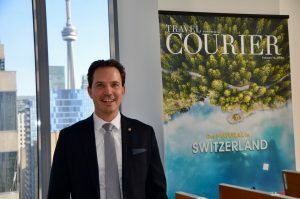 As for the Canadian market, Prinz says Switzerland saw the best overnight results in 25 years from Canada with an 11.2% increase in arrivals in 2017. 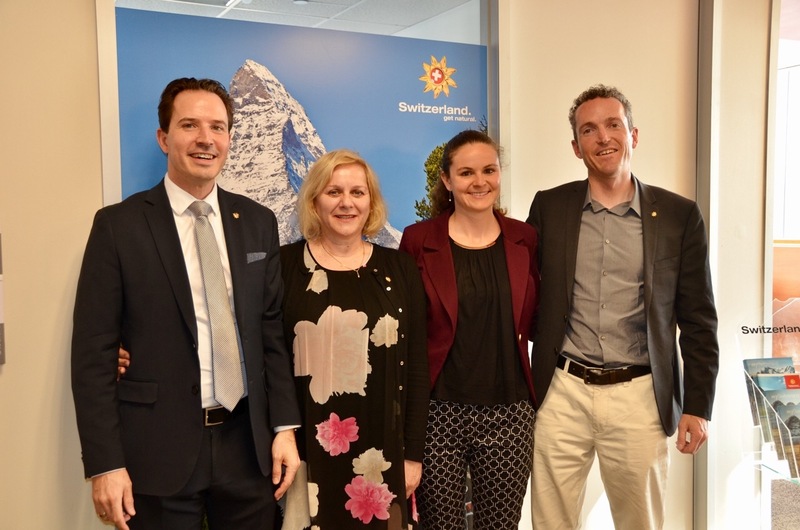 For travel agents interested in becoming Switzerland Travel Experts, he says the trade can visit the Switzerland Travel Academy at www.myswitzerland.com/trade. “It’s three hours, we keep it short and sweet,” he says. In winter, reduced ski ticket offered by many hotels in selected destinations. 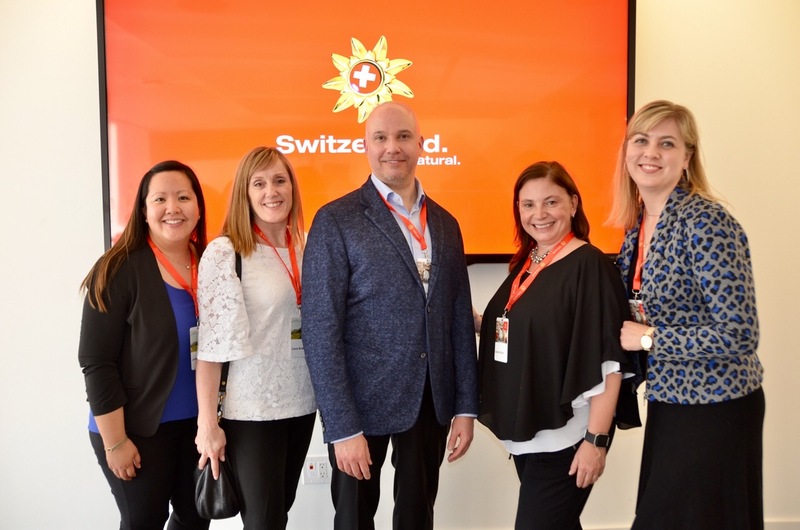 Pictured (top) at the summer launch event in Toronto are Prinz; Ursula Beamish-Mader, Manager, Media Relations North America, Switzerland Tourism; Christy Keller, Market Manager, North America, Switzerland Travel Centre; and Martin Oester, Sales & Marketing Manager, North America, Swiss Travel System. 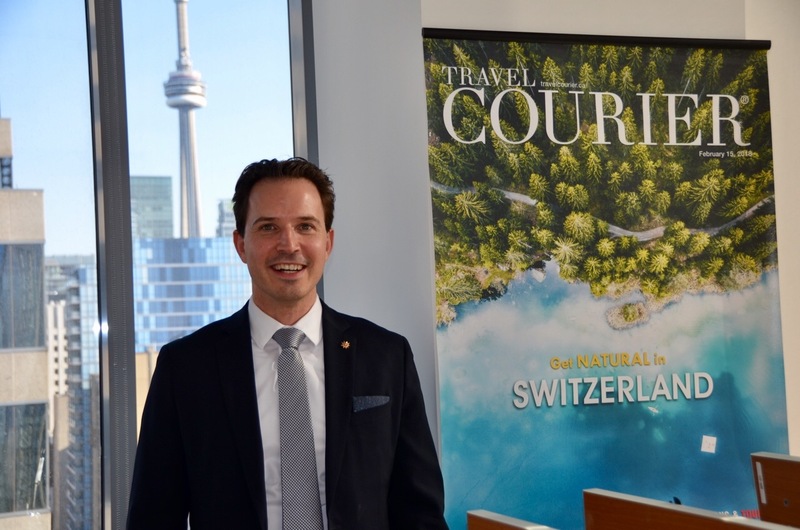 (Middle) Prinz in his office with a recent edition of Travel Courier. (Bottom) Representatives from The Travel Corporation on hand for the event.